Almost 90 acres of former farmland that has been reverting to woodland for four or five decades. 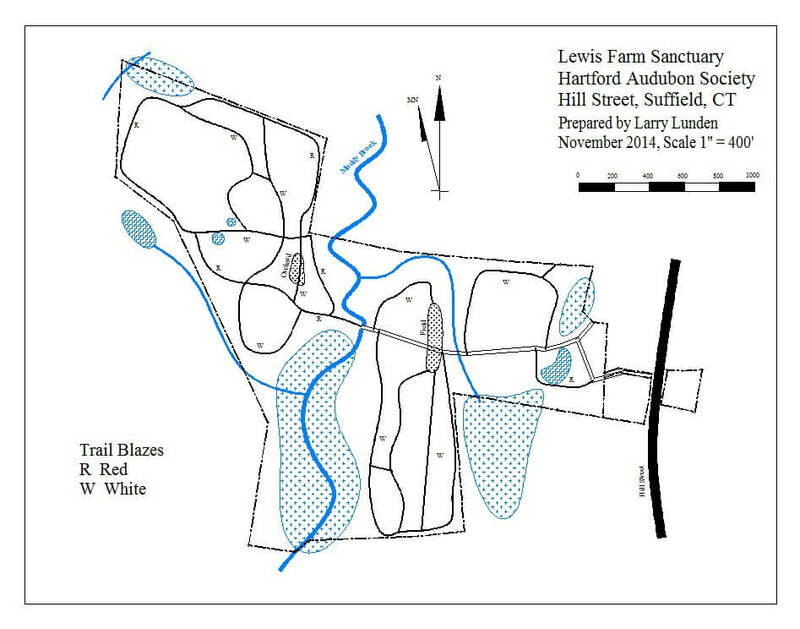 Mostly wooded, traversed by a stream emerging from a wetland and with a small pond in another low area, it lies at about 150 ft elevation in central Suffield, CT. The entrance roadway is at 1035 Hill Street, about 2 miles north of Route 168. Watch for the sign beautifully restored by Sally Markey. (removed October 25 - to - April 30) Park on the east side of Hill Street, just off the roadway surface, and walk into the sanctuary. There is a trail map on a signboard where the entrance road opens into a grassy area with benches. We have a long-term forest management plan to guide our habitat improvement efforts. Insect repellent is recommended in summer.